My Mind Wanders...: An Easy Mark? 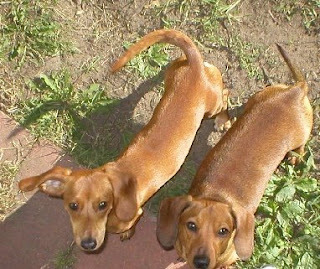 Meet Ike(skinny boy) and Russet(more to love boy) my furry little guys. Personable, snooty, lovable and rip-roaring pile of fun can all describe these guys, but mostly they are spoiled. Yep, yummy food to eat, treats whenever they bat their baby browns. Chews to work on and blankets galore fill their kennel. See spoiled -- they think they rule the roost! I kid -- the three of them get along fairly well. Today, however, they provided me with one heck of a chuckle at lunch time. Darling Diva is blooming this summer and wanting to do things on her own. Yay, and sigh. Any who, she made her bologna and cheese sandwich and came into the office to watch a movie and eat. What she didn't know is that SB and MTL boy were hiding under the covers. Well you can imagine their joy to smell the yummy food. All of a sudden two black noses peeked out and were going to town. Soon it was their heads and before ya know it, they had slunk on over to DD and started in with the look at how cute I am eyes and gimme gimme whines. Now I would have caved, cause lets face it, I'm an easy mark. But what does DD do? She turns to them and says "Go away! Mom, tell them to go away." Nope, no easy mark that one. Hey, the pups' life would be boring if everyone was an easy mark. I got the head in the lap approach from my doggie...but it's always the eyes that get you. Yep, their lives would be boring if everyone was easy...not they have to work a little harder at it!